Choose trick over treat with our economy Bloody Eyeballs! These flexible plastic hollow-back eyeballs feature painted blood vessels and attached flesh, as if they've been ripped out of their sockets. Add them to Halloween party favor bags, ghoulish Halloween scenes or trick-or-treat bags! Looks so real packaged right from the Morgue Undertakers Laboratory! Gruesome Grocery Store prop... with Puddles of RED fresh looking Blood! Detailed in White , Red and Gray Multi- Color. 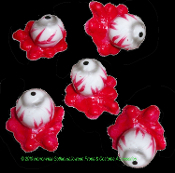 These 3-Dimensional RUBBERY PLASTIC Squishy Eyeballs will be watching you! Each approx. 1.5-inch Diameter x 1.25-inch Deep (3.75cm x 3.13cm) – Eyeball without blood puddle approx. 1-inch (2.5cm) diameter.